…is often different from the French spoken in France. I still remember the first time I came to francophone W Africa back in 1993; even though I was a graduate in French, it took me a good few weeks to ‘tune in’ and understand everything which was said. This is partly due to the accent/pronunciation of words, but also a different vocabulary. There you go! Any other differences you know, please leave a comment! Don’t you? Of course you do – they’re GREAT!!! There’s nothing quite like peeling back that warm tin lid to reveal a steaming, perfectly rectangular, tasty meal – usually beef & rice or chicken & rice or, if you’re lucky, potatoes instead of rice. Then there’s the small packets of butter, milk, sugar, cheese…not to mention the ubiquitous ‘refreshing lemon towel’. I love the plastic cutlery, the crusty bread rolls…and those cute little bottles of wine! A friend of mine once saw a Beninese nun ask for extra wine TWICE then promptly stuff them into her bag! 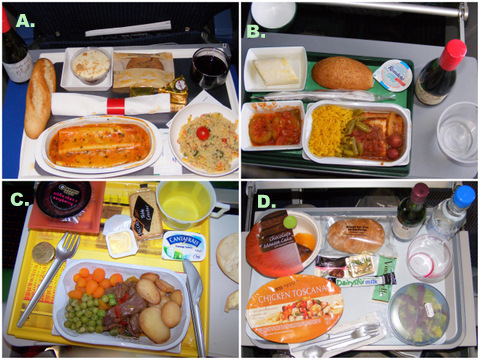 So, frequent-flyers everywhere, it’s QUIZ TIME!!! First of all, I bought the blue one in the middle for round Â£3.00. The blue plastic bits on the handle fell off as soon as I took it out of the packaging and it just about managed to open ONE tin before giving up the ghost. 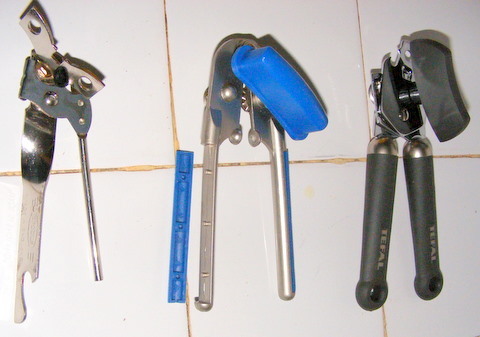 So then, I bought a classic, ‘twisty metal’ tin-opener (left) for 50p from the market – surely can’t be as bad as the first one, after all my Mum used one for years when I was a kid! It lasted almost a week, and then the small plastic ‘washer’ dislodged, thus rendering it incapable of opening any more cans. Thirdly, I bought one of those horizontal ones that lifts the whole lid off. Cost me around Â£2.50, but it was so bad that it got thrown in the bin before even having chance to pose for a blog photo! Finally, it had to be done, I shelled out a whopping Â£8.00 on a pucker TEFAL tin opener (right & below), which is almost the total of what I had paid thus far for my ‘dodgy’ openers. I am happy to say that this one is still going strong a month later, thereby dramatically outstripping its contenders on the ‘tins per Â£’ scale! So, I guess the moral of the story is, don’t buy cheap tin-openers in Africa, especially as warranties and refunds are few and far between. 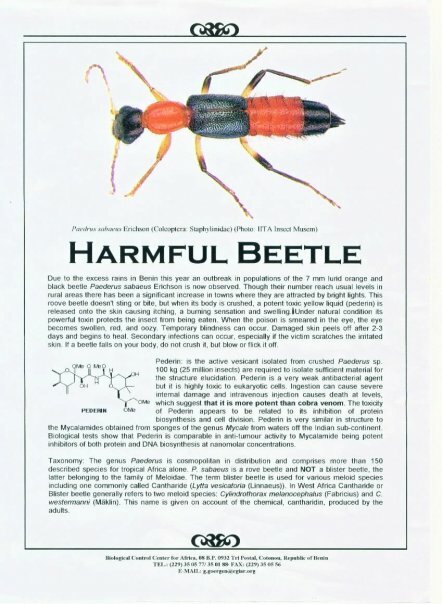 Beware of the Blister Beetle. Rather, blow it off if you can, or get a friend to help! This very morning, Lois arrived at school to find no fewer than SIX of these paederus littoralis in her classroom and had to evacuate the room immediately. That’s because they can cause serious injury to human skin. 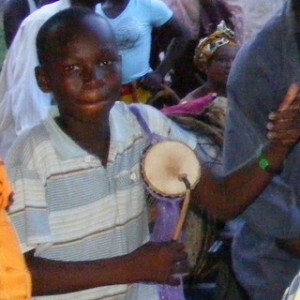 They are common in much of W Africa around this time of the year. In fact, a friend at another school in Bamako had them in her classroom too, and 3 pupils got burns on their hands as a result! It’s still hard to read the text even when enlarged, but one mildly distressing phrase reads “intraveneous injection causes death at levels which suggest that it is more potent than cobra venom.” Hmmm. Mind you, before you panic too much, I don’t think any of us are planning on injecting them into our bloodstreams. Also, quantities of the venom per insect would be significantly less, I should think. 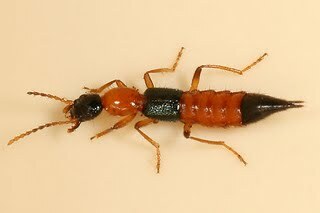 I’ve also been told that the correct name for this insect is the rove beetle. Also, see a doctor’s take on these nasty bugs here (which is where the opening picture came from). Beware! 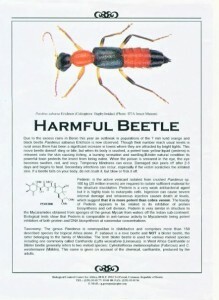 There are images to be seen of rove beetle burns on humans! Thank you for reading – mind how you go now! Yesterday, we had a HAIL STORM in Bamako!!! I know it’s hard to believe, but it did actually happen – and quite sizeable hail stones too! At 5:30pm or so, it was 34 degrees C outside; five minutes later, it was down to 21 and hail was falling! Unbelievable! There you go; a blog-worthy bit of news if ever there were one! So, there you go. 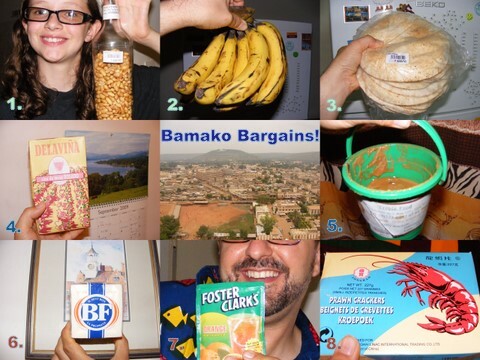 Life in urban Africa doesn’t need to be too pricey, it’s just knowing what (and where) the bargains are! …and it all happened just down my street!! Yes, on Friday evening, there was a wedding celebration just down the road. 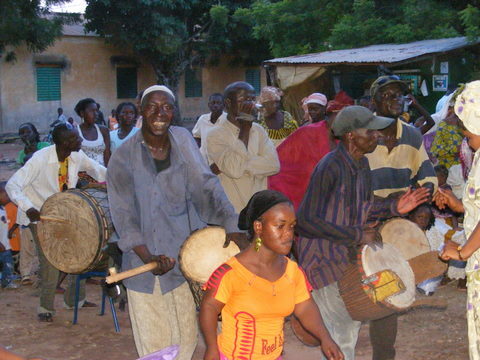 I heard it from my house, so ventured out to investigate and ended up dancing with the ladies and playing one of the drums! (Some of those trees in the distance are in my garden!) 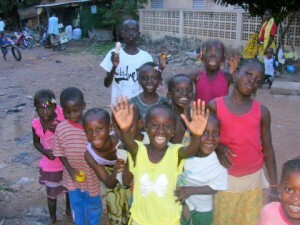 Wehay, just like the old days in Benin, but without all the driving first! 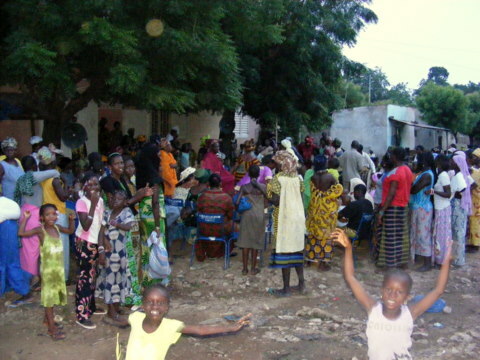 Also, remember to click here to read about the African funeral, which happened down my street in Benin. Thanks for reading – that’s all for now.